I know some people get sick of flowers. Me--nope, can't say I do. LOL I think they're always appropriate, and they just plain make me happy. 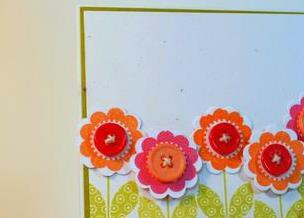 Here's a little flower card I made that was easy, and the results are bright and fun. Want to know how I made it? Ok, I'll tell ya! I started with a plain white 51/2 x 4 1/4 inch card base (A2 size), and adhered a piece of Ripe Avacado cardstock, trimmed to 5 3/8 x 4 1/8. On another piece of white cardstock (trimmed to 5 1/4 x 4) I stamped the leaves from Floral Fusion 1 about an inch or so from the bottom, using Ripe Avacado ink. To add interest, I made sure the leaves were zig-zagged rather than straight across, and that some of them were stamped off the paper. Next I stamped the sentiment from Sending You in black VersaFine ink and tied on a Ripe Avacado saddle stitched ribbon. To make the make them, I die cut them using the matching Floral Fusion 1 die using a coaster. This particular coaster stock from PaperTrey cuts beautifully with their dies and adds a little something that cardstock alone can't match. And it stamps beautifully too, which is what I did next. Using the matching stamp from the Floral Fusion 1 set, I stamped each die cut alternating between Orange Zest and Raspberry Fizz. (Who said orange and hot pink clash??). Then I applied the finished flowers to the tops of the stems with pop dots. For a final touch, I added twine to Orange Zest and Raspberry Fizz buttons, and attached them to the flower centers with glue dots. See, I told ya--simple. Bet you could do it too. Whatcha' waiting for? Go give it a try and thanks for stopping by! This card is sweet Kathy. I love the depth in it. Papertrey makes such great stuff. I think I'll have to add this set and dies to my wish list. Lovely card. I also love pink and orange together. Wow, you really make some nice cards. Love the manly one in the post above too.